Everyone Deserves Access to Fresh Food. The Olympia Farmers Market is proud to accept EBT cards and offer a source of local, fresh and nutritious foods to SNAP recipients. 1. Go to the Olympia Farmers Market office window. 2. Swipe your EBT card and receive EBT Market Tokens. 3. Use EBT Market Tokens to purchase any food items under the market barn roof including fresh fruit, vegetables, vegetable starts, herbs, mushrooms, cheese, jam, bakery items, etc. Market Tokens cannot be redeemed for cash and no change can be given for purchases. EBT Market Tokens do not expire. 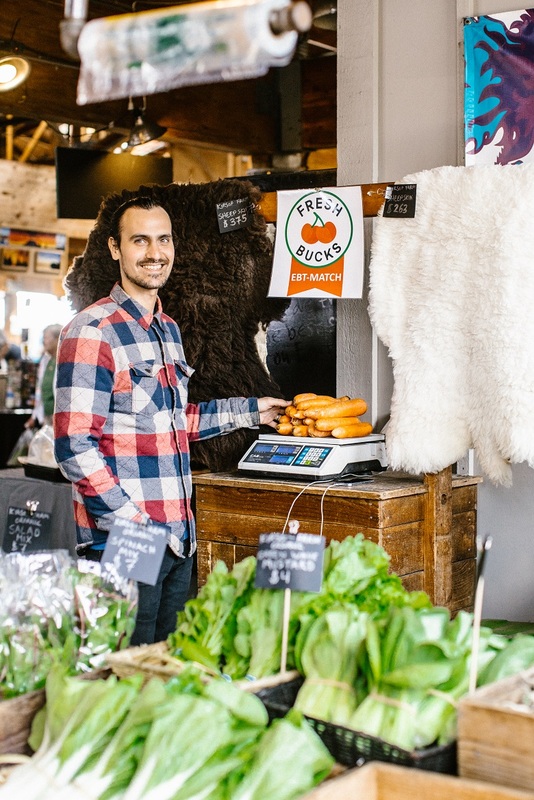 Fresh Bucks is a collaboration between the Olympia Farmers Market and the Washington State Department of Health, thanks to a grant from the United States Department of Agriculture. 3. Double your dollars. Fresh Bucks provides SNAP / EBT shoppers with extra buying power, by providing an additional dollar for dollar EBT match of up to $20 per day. 4. Fresh Bucks can be used to purchase fresh fruit, vegetables, vegetable starts, herbs and mushrooms from any local farmer at The Olympia Farmers Market. (Note: Fresh Bucks cannot be used with the fruit resellers at the east and west ends of the market as Fresh Bucks have been designated to support local farms.) Fresh Bucks cannot be redeemed for cash and no change can be given for purchases. Fresh Bucks expire annually. Many farms at The Olympia Farmers Market accept WIC Farmers’ Market Nutrition Program (FMNP) checks. Participating farms accept the checks as cash. Funded by both the United States Department of Agriculture and the State of Washington and managed by the Department of Health, the program’s goal is to provide fresh, healthy, unprocessed, locally grown fresh fruits, vegetables, and cut herbs to WIC families and low-income seniors. The program also seeks to expand awareness and sales at farmers markets. WIC checks are distributed annually in Thurston County through Sea Mar Health Clinic and in Mason, Lewis and Thurston County through the Community Action Council. As these have been designated to support local farms, WIC checks cannot be used with the fruit resellers at the east and west ends of the market. WIC checks cannot be redeemed for cash and no change can be given for purchases. WIC checks expire annually. Many farms at The Olympia Farmers Market accept Senior Farmers’ Market Nutrition Program (SFMNP) checks. Participating farms accept the checks as cash. Funded by both the United States Department of Agriculture and the State of Washington and run by the Department of Social Health Services, the program’s goal is to provide fresh, healthy, unprocessed, locally grown fresh fruits, vegetables, and cut herbs to low-income seniors. The program also seeks to expand awareness and sales at farmers markets. As these have been designated to support local farms, Senior checks cannot be used with the fruit resellers at the east and west ends of the market. Senior checks cannot be redeemed for cash and no change can be given for purchases. Senior Checks expire annually. Please email info@olympiafarmersmarket.com with any questions. 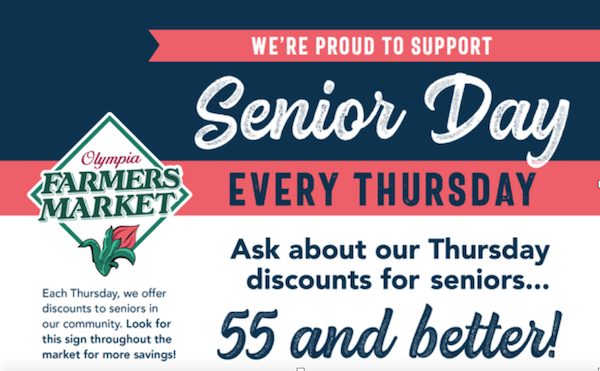 Thursday is Senior Day at The Olympia Farmers Market! Many vendors offer discounts to Seniors on Thursdays from April through October. Look for this sign in participating vendors booths!